The product is indicated for the maintenance treatment of asthma as prophylactic therapy in patients six years of age or older. 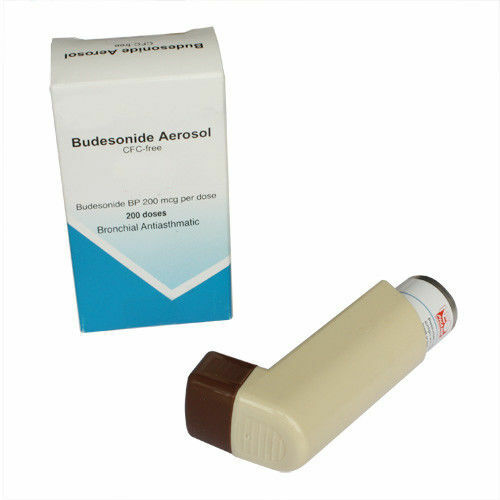 After priming, each actuation of the inhaler delivers 200mcg of Budesonide. Budesonide inhalation suspension is NOT indicated for the relief of acute bronchospasm. Budesonide has a high glucocorticoid effect and a weak mineralocorticoid effect. It binds to the glucocorticoid receptor with a higher binding affinity than cortisol and prednisolone. When budesonide is systemically administered, suppression of endogenous cortisol concentrations and an impairment of the hypothalamus-pituitary-adrenal (HPA) axis function has been observed. Furthermore, a decrease in airway reactivity to histamine and other entities has been observed with the inhaled formulation. Generally, the inhaled formulation has a rapid onset action and improvement in asthma control can occur within 24 hours of initiation of treatment. Budesonide is an anti-inflammatory corticosteroid that exhibits potent glucocorticoid activity and weak mineralocorticoid activity. The precise mechanism of corticosteroid actions on inflammation in asthma, Crohn's disease, or ulcerative colitis is not known. Inflammation is an important component in the pathogenesis of asthma. Corticosteroids have been shown to have a wide range of inhibitory activities against multiple cell types (eg, mast cells, eosinophils, neutrophils, macrophages, and lymphocytes) and mediators (eg, histamine, eicosanoids, leukotrienes, and cytokines) involved in allergic and non-allergic-mediated inflammation. These anti-inflammatory actions of corticosteroids may contribute to their efficacy in the aforementioned diseases. Because budesonide undergoes significant first-pass elimination, the both oral preparations are formulated as an extended release tablet. As a result, budesonide release is delyaed until exposure to a pH ≥ 7 in the small intestine.